It is the solo-travelling that allows me the solitude, freedom from distraction, and time to discover these miraculous creations. Because I was by myself today, I had the luxury to linger for as long as I chose over humanity’s remarkable beginnings. But, that dreamlike wonder is gone now. It has deserted me and gone to find a nice cafe to rest it’s feet and drink a glass of wine. My head can hold no more, my eyes do not want to view another sculpture, no matter how ancient, no matter how significant. I don’t care which pharoah lies mummified in the next room. I have an increasingly aching mid-upper back from carrying all these heavy lenses, a heavy camera, and the darn audio guide which has almost strangled me a few times. Plus, I have my notebook in which to write all my newest revelations and my guidebook to tell me more. It was too heavy a load, a load of my own silly making, and my back is squawking. All I want to do is leave. 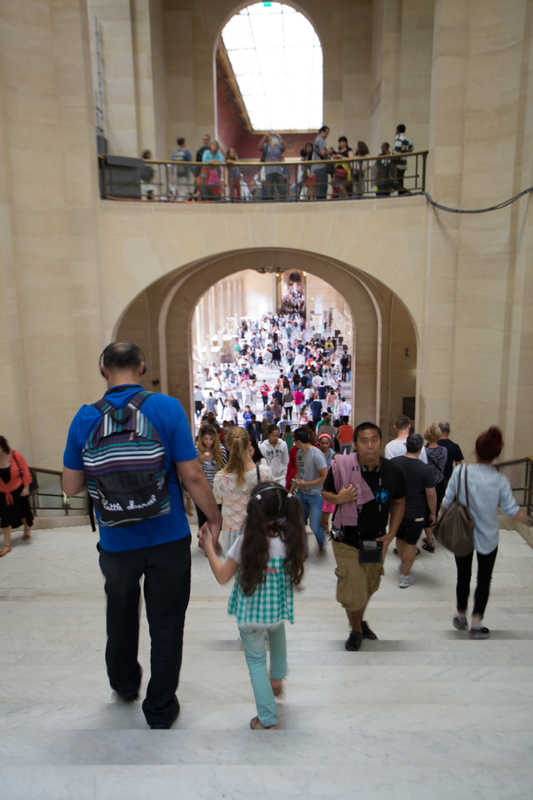 Museum fatigue is now the chief distraction: it has caught up with me and…even if it is the Louvre, it’s time to go. 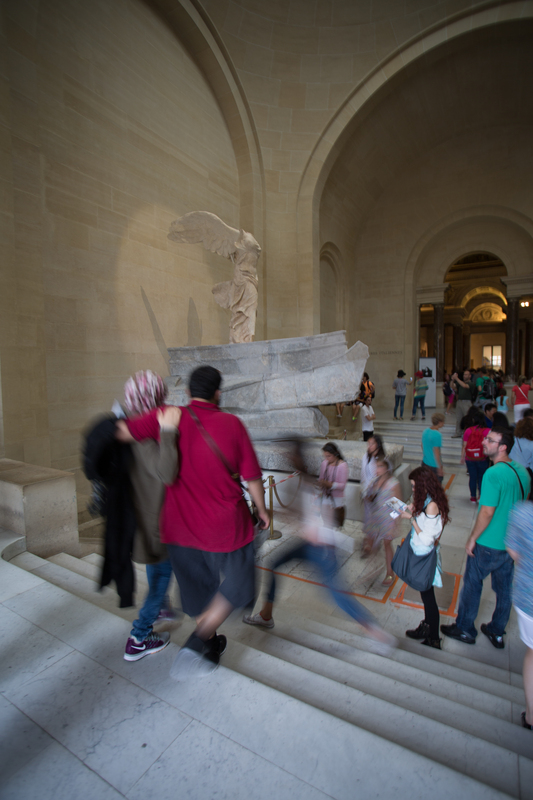 Let me just admire the Winged Victory of Samothrace for a moment – she is so spectacular – as I move through the Denon wing and toward the exit. Nope. I don’t even want to stay here that long. There’s just too many people and I’m so done. Looking outside from the Denon Wing down onto the Cour Carrée, I see it’s not too terribly wet. Most of the rain hit while I was inside the museum. Good. Still won’t need the umbrella I left at the hotel! 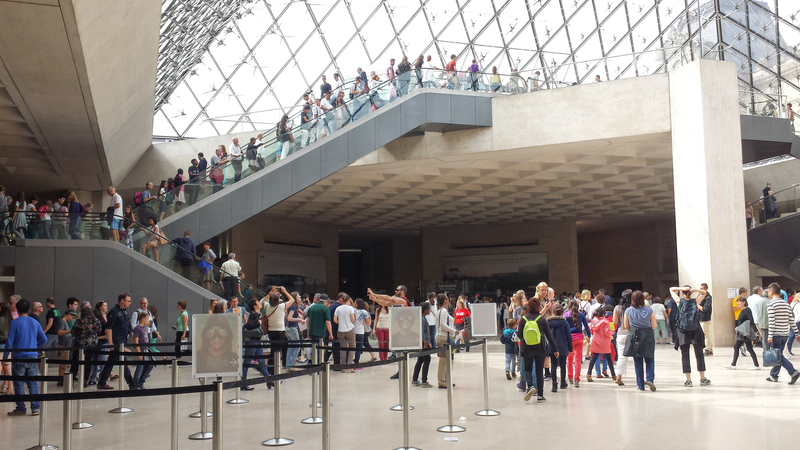 A lot of people are choosing to leave the reception area via the stairway up and out of the pyramid. Not me. 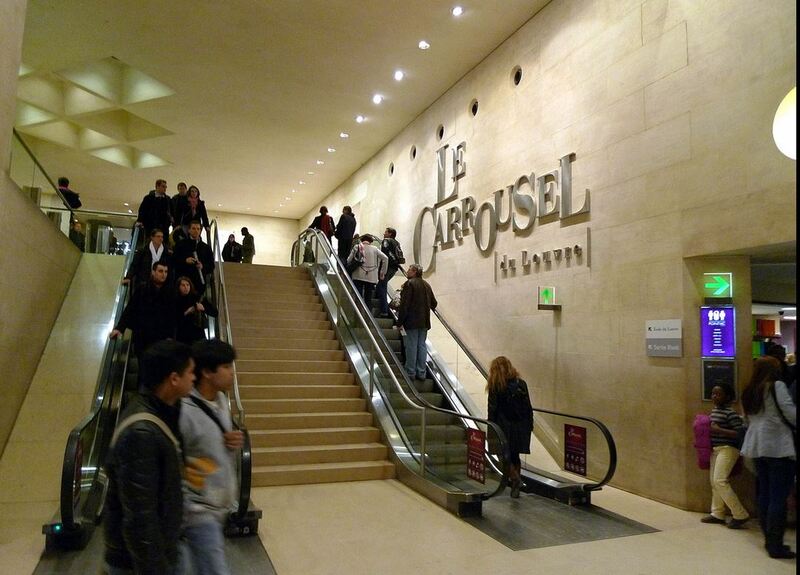 I think I’ll stay underground a bit longer and stroll through Le Carrousel du Louvre, the underground mall attached to the Louvre. No. 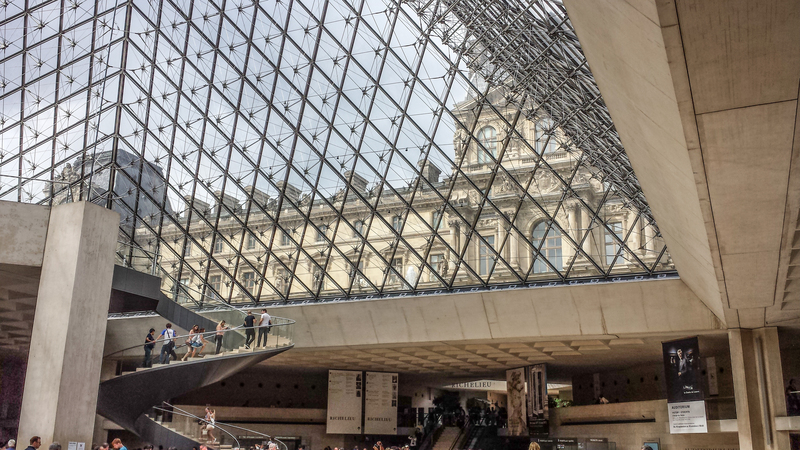 Instead, I shall leave the Carrousel du Louvre via its exit onto Rue de Rivoli, and walk the few short blocks to my Hôtel Louvre Bons Enfants where I will lie down and absorb all I’ve seen and experienced. Or, not. Perhaps, instead, for a time at least, I’ll not pressure myself to absorb or re-experience anything. Perhaps, just for a while, I’ll just be; with my eyes closed. And, then I’ll go catch up with my dream-like wonder and join it for that glass of wine!